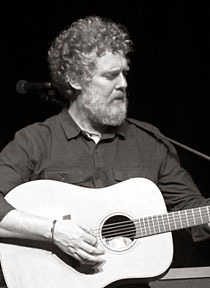 When Glen Hansard was in Tulsa, Oklahoma last September he got a personal tour of the Woody Guthrie Center. And there it was in the archive, a lyrical put-down of Fred Trump, father of Donald and a landlord with questionable housing practices in Brooklyn. Glen has used the spirit of the words to inform his version of the Guthrie tune, ‘Vigilante Man’. The original dates back to 1940 and pictures the thugs who patrolled California, fighting off the poor incomers from the Dust Bowl states. In the Glen version, the baddies also include Fred Trump and his son, collectively “rotten to the core”. Gesture politics is one thing but Glen was a proper activist over Christmas. On 16 December he was on the Late Late Show, telling Irish TV viewers that his mates in the Home Sweet Home organisation had taken over a vacant office building, Apollo House, and were using it as a refuge for homeless people. This was NAMA property, part of Ireland’s bad debt, collateral from the banking bail-out. And yes, Glen admitted, this amounted to “civil disobedience”. By his own admission, he is wired and confused from the four week occupation. Musicians gave character and focus to the action and Glen did not shirk. But he’s also been overwhelmed by the tide of politics, factions, double-speak and diplomacy. Apollo House was cleared two days ago. It was inspiring and they did fight the law, but it’s too early to tell if the law won. So the Seamus Heaney HomePlace is a respite and a solace. It’s a chance to alternate music with poetry readings, although his choice of Heaney’s Requiem For The Croppies puts us back on the road to revolution. Elsewhere there is the open call of ‘Love Don’t Keep Me Waiting’, the gift of ‘Winning Streak’ and a remembrance of his own family’s working socialism and the “drunkles” on the sofa who inspired ‘Lowly Deserters’. This location is built on poetry, set into the landscape of the man while the performance space is The Helicon, a reference to that poem about words, mysterious flow and the slap-back of creation. Glen is drinking it up and reading the delicious prose of Leonard Cohen and ‘How To Speak Poetry’. You see an artist in a live act of restoration – filling his heart, getting nourished, remembering his mother on ‘Bird Of Sorrow’ and trimming his sails to Van and ‘Into The Mystic’. He is joined by Brendan Begley on the button accordion for some polkas, songs and a drinking toast as Gaeilge and of course ‘Falling Slowly’, reason enough to forget gravity, time and fatigue. An Oscar winner in the home place of a Nobel Prize poet. It’s too late to lie down.